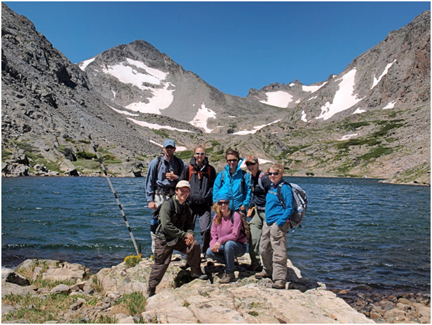 Keck Colorado group in the Green Lakes basin, highest of the three study catchments. What: The Keck Colorado 2011 project will work with a large interdisciplinary study (Boulder Creek Critical Zone Observatory: Weathered profile development in a rocky environment and its influence on watershed hydrology and biogeochemistry-NSF 0724960) directed by Suzanne Anderson, Institute for Arctic and Alpine Studies (INSTAAR), University of Colorado. The Keck Project focus is measurement and sampling of geologic deposits and processes in the critical zone, “the heterogeneous carapace of rock in various stages of decay, overlying soil, and the ecosystems they support… fundamental characteristics of the critical zone, such as its thickness, the character of the weathered rock and soil layers and the biological activity within them, together control the passage of water, the chemical processes operating, the material strength, and the function of subsurface ecosystems.” The “observatory” consists of 3 small, instrumented sites in the Boulder Creek basin: (1) Green Lakes Valley-a steep, glaciated alpine area in the Boulder watershed where “fresh” materials are exposed at the surface; (2) Gordon Gulch-a forested, mid-elevation catchment developed in weathered materials, and (3) Betasso-a steep, lower-elevation basin where surficial deposits are of variable thickness. Using synoptic sampling of stream chemistry to help study weathering rates in Gordon Gulch. Measuring local variations in rock strength and erodibility using Schmidt hammer techniques. Mapping the depth to bedrock and the structure of the shallow subsurface in Gordon Gulch using resistivity and ground-penetrating radar techniques. 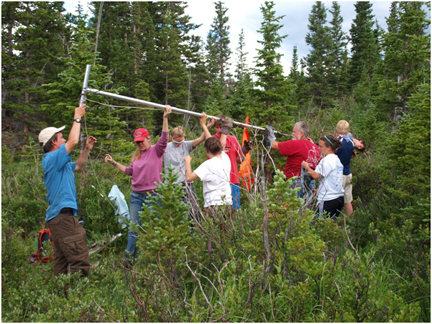 Measuring variations in soil morphology, chemistry, sediment generation and transport processes along slope transects from ridge crest to channel using field, geochemical and cosmogenic radionuclide (CRN) techniques. Comparing the coupling between hillslope erosional processes, channel morphology and sediment transport in Betasso and Gordon Gulch using cosmogenic radionuclide (CRN) techniques. We’ll be at elevations ranging from 5,000 to 12,500 feet and working in environments from the hot semidesert to late-lying snowfields and summer hailstorms! Participants will stay at an elevation of 9500 ft at the University of Colorado’s Mountain Research Station on the shoulder of Niwot Ridge and within hiking distance of the Green Lakes site. Cabin accommodations are rustic but they’ll serve us well! Nederland, the nearest town, is about 20 minutes to the south. The Boulder urban area is about an hour away. The Lab has a research building with a library, a few computers and wireless connections. We’ll have breakfast and dinner 5 days a week at the dining hall and we’ll make bag lunches to take to the field. We’ll make other arrangements for Saturdays and Sundays!